Origins 2017 Preview — GamingWithSwag.com - Dads By Day, Gamers By Night. The Origins Game Fair, entering its 21st year in Columbus, Ohio, is the second largest tabletop gaming convention in the United States (likely to become the 3rd largest once PAX Unplugged happens in November). Unfortunately for Origins, GenCon: the largest tabletop gaming convention in the world now, takes place a scant 2 months and 180 miles away. This has meant that several of the bigger companies in the hobby have much presence at Origins. I actually welcome this because it gives smaller companies and games a much better chance at getting discovered. Origins is a rather laid back, relaxing convention, especially since they’ve opened up a second game hall for some of the larger companies that do show up. It’s rare to find long lines of crazed fanboys, though they do still happen on occasion. Origins is far more about playing games and meeting new people than it is about the new hotness. But that doesn’t mean there’s nothing new to see, far from it, in fact. The tireless W. Eric Martin over at Board Game Geek spends hours upon hours putting together extensive previews in the weeks leading up to each convention. At the time of writing: the Origins 2017 preview contains 171 items, and probably isn’t done yet. To be clear: these are not all games that are being released at the show. Some of them have been out in the market, but this is their first time shown at Origins. Some are only there in demo form to be followed by a Kickstarter or GenCon release. Yet others are, making their debut at Origins. In this preview, I plan on showing off the top 5 titles that are expected to be for sale that have my attention, and 5 titles that are going to be there in demo form only- but sound good enough to keep a look out for. I must say that my tastes skew a bit to the lighter side of the spectrum, and I am kind of a sucker for a weird theme, or unique components…as you’ll see later. Paring these lists down to 5 was nearly impossible as there are honestly at least 50 games on the list I want to play. I was going to try and pretend that this wasn’t my most anticipated game at the show, but I’d be lying. I’ve already had a chance to play it three times, and it is still absolutely the #1 game I’m excited to see at Origins. 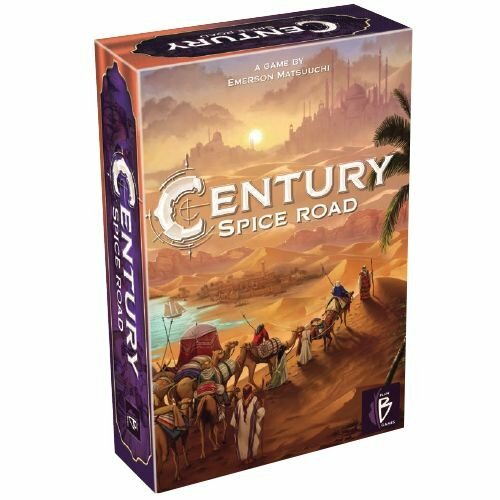 The game has one of the most boring themes ever: spice trading in the Middle East (a second version of the game, called The Crystal Golem, was sadly scrapped). It’s the engine building and interesting card drafting mechanisms that make this game great. Many people are calling it a Splendor killer, and they may just be right. It definitely has the same ease of entry, but with far more strategy. There are also three more games planned that supposedly can tie into this one, which is an intriguing concept. Not Alone is an asymmetrical card game where one player is a monster on their home planet, and the rest of the players are an away team, waiting for the rescue ship, just trying to survive. I’m not usually a cooperative game fan, but this one seems to have a lot of theme to it. It seems to combine some deck building a little bluffing to make a unique gaming experience. 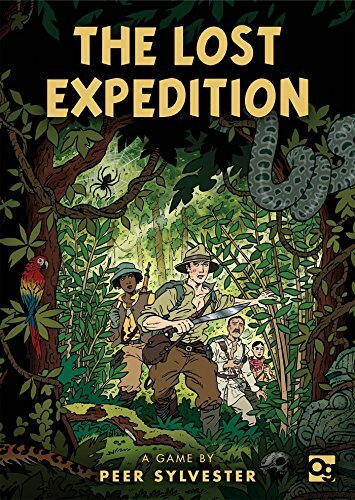 The Lost Expedition is a cooperative card game where players are trying to find the missing explorer Percy Fawcett as he was lost trying to find the Lost City of Gold - El Dorado. Another co-op? What’s wrong with me? This game has my interest for two reasons. For one, I’ve read that it may play best as a solo game, and I do enjoy solo games from time to time. Secondly, this game has great Adventures of Tintin comic book art. I have read reviews that this game can be brutally hard to beat, but I’m up for the challenge. One of my favorite end of night cool down games is Liar’s Dice. 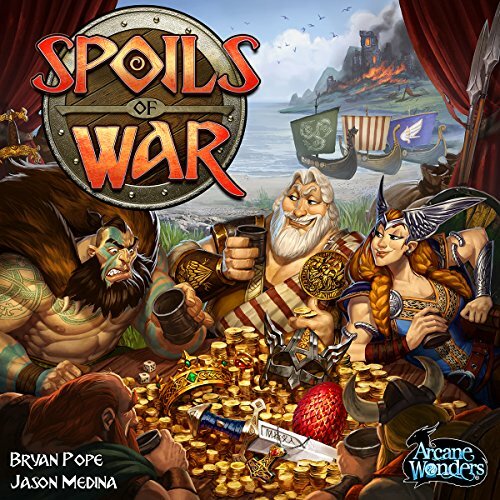 Spoils of War takes the dice rolling and bluffing mechanics of Liar’s Dice, and puts more game in the box. By all accounts, this sounds like it might be a worthy replacement for Cash ‘n Guns. Even better is that you can take two copies of this game, and play a 10-player mega game…which sounds completely insane. More than just being about pinball…you ARE the pinball. Multiball has just started, and players are the pinballs careening wildly around the table, trying to take down the best targets. 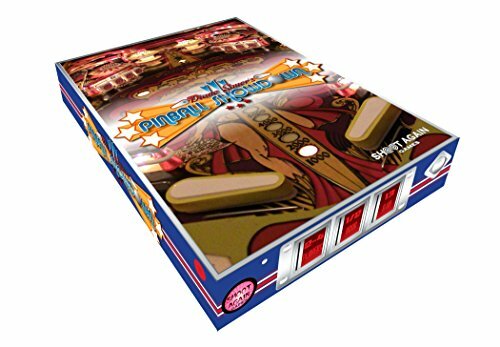 In game terms, Pinball Showdown is an auction game combined with set collection. Players will use control / speed tokens to gain pinball features (bumpers, flippers, spinning targets etc) in hopes to be the highest scoring ball after 10 turns. The cards all have art from vintage machines, and I’m a sucker for auction games and unique themes. The next five games are said to be only available for demos. Take the childhood game of Kerplunk, and add in Cthulhu. Made by Smirk & Dagger Games: the same warped people that made Chutes & Ladders and Candyland into mindless killing frenzies. This one is a must play. Players take on the roles of hospitals trying to take care of wounded heroes (think Final Fantasy style). Unfortunately, there are too many to care for, so you send your opponents the annoying ones. Japanime Games makes the underrated Tanto Cuore deck builder. I expect lively anime art and fast, fun gameplay. Castles of Mad King Ludwig is one of my favorite games of all time. This pseudo-sequel has all players building rooms into the same palace. There are some similarities to the first game, but this promises to be an entirely different experience. That title alone shot this one onto my list. This game is a pure cooperative game where players are trying to run around a mansion turning off traps, and trying to steal treasure. I’ve only seen prototypes of this one, but Fun Forge makes beautiful games. I’m a bit turned off by pure co-op, but I may try and give this a play. I have no interest in Anime, and Cryptozoic is not one of my favorite companies, and this is ANOTHER cooperative game (although it is 1 vs. Everyone else, which I do like a bit better). So why does it have my interest? Just look at it! One player plays as the Titan, which in this game is a 1 foot tall piece. The other players are humans that can increase their chances of doing damage to the Titan by climbing up to higher levels. This one has a ton of cool factor to it. It remains to be seen if the game play holds up. I hope this gave you a little bit of an insight into what kind of things I’ll be looking for at Origins in the coming week.